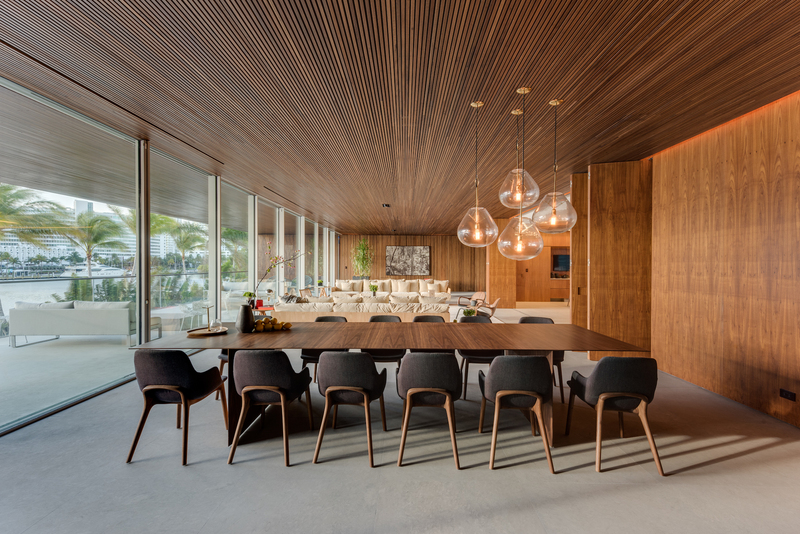 The striking contemporary home in Miami was built on spec in 2016 by Brodson Construction from a design by Marcio Kogan of Studio MK-27 . 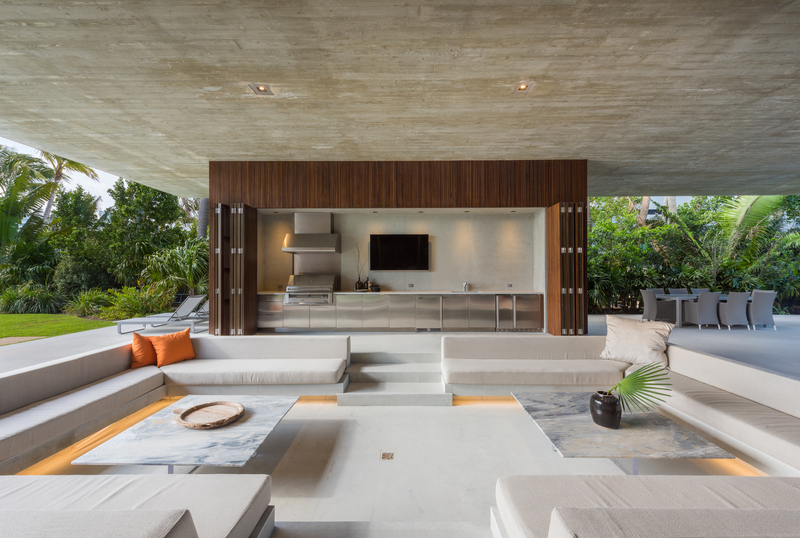 The home’s design uses raw materials including exposed concrete, stone, and teak wood to enliven its nested box appearance. 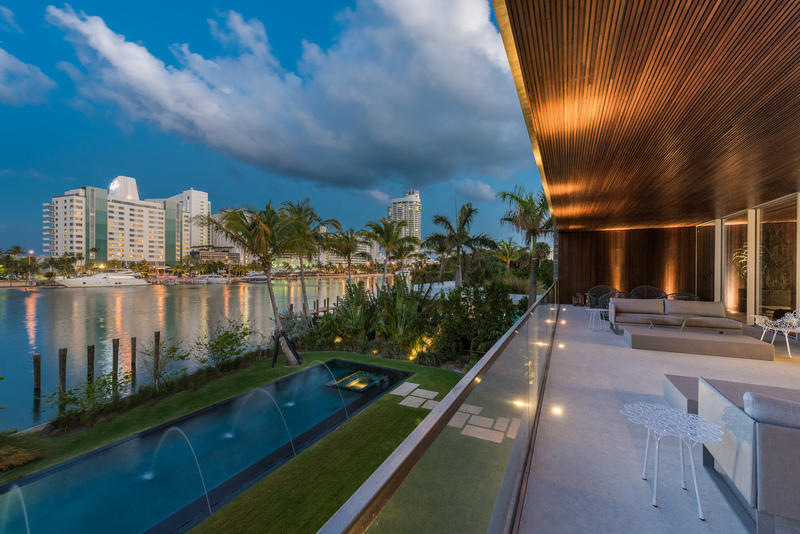 A 1,800-square-foot covered terrace features a full outdoor kitchen and sunken living room. 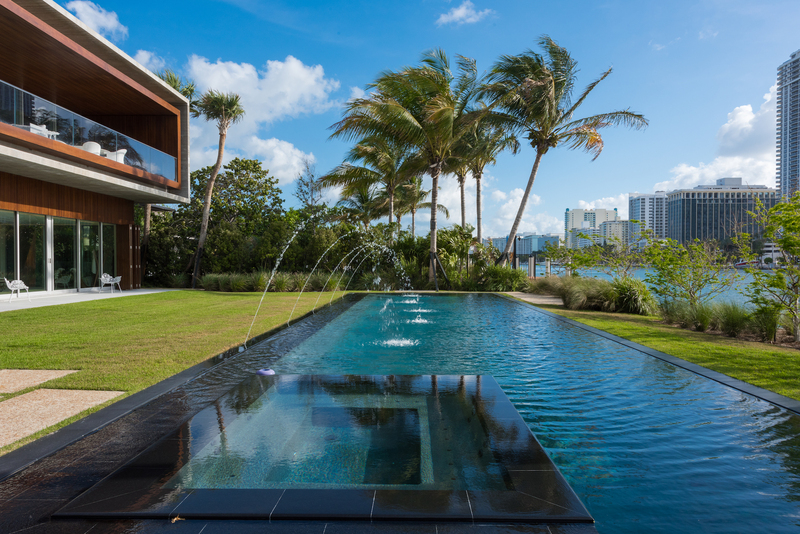 The surrounding landscape features a clean linear saltwater pool positioned parallel to Indian Creek, as well as a natural swimming pool that measures 100 feet x 30 feet filled with organic filtration and live fish. 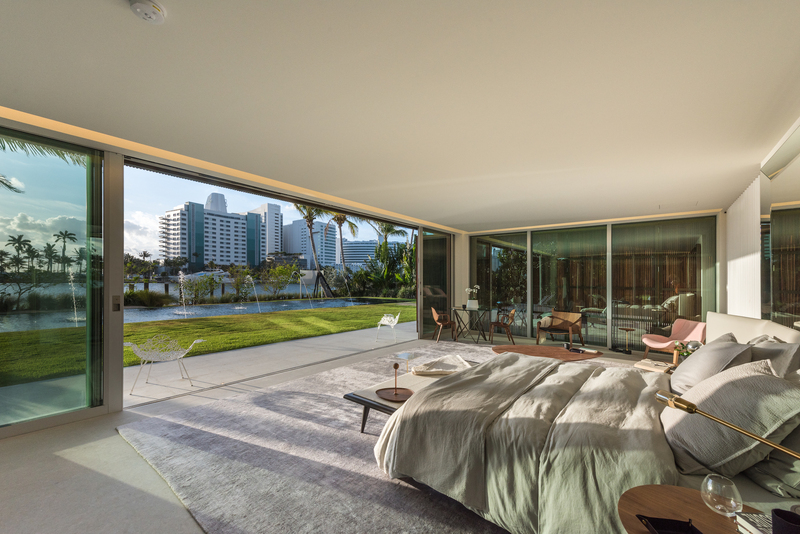 The interior program of the home is dictated by the second-floor public living space, which frames a view of Collins Avenue and the Eden Rock and Fontainebleau hotels, and boasts a rooftop terrace capitalizing on the same view. The ground floor features a string of four bedrooms, which open to the natural swimming pool and ends with a corner view master suite facing the water. 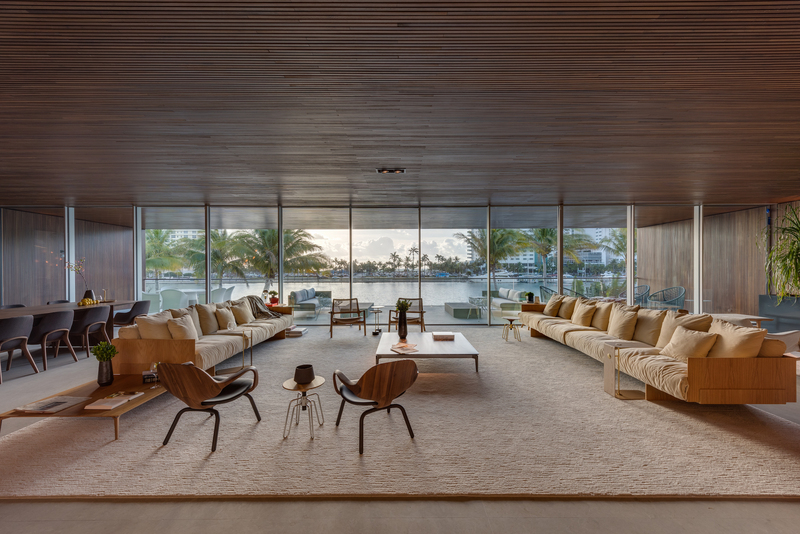 Visible from Pine Tree Drive and adjacent to the bedroom wing is a separate area of the home which can be used as an indoor half basketball court, entertaining hall for parties or art exhibit area. This room serves as the anchor of the house, cutting off the private experiences of the home from the street. The six-bedroom home has 12,000 square feet and sits on one acre with water frontage on Indian Creek. A man-made lagoon measures 100 ft. by 30 ft. filled with fish and surrounded by lush landscape. It was designed with steps and a filtration system to encourage swimming. 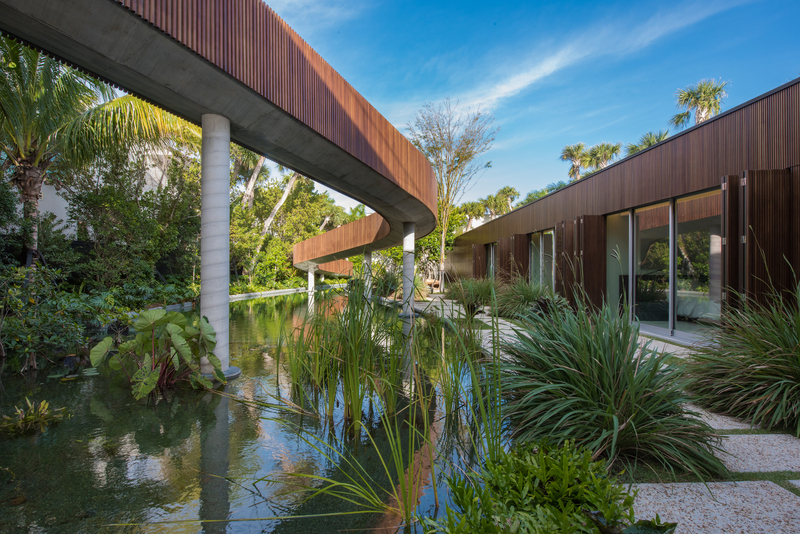 A 200-foot-long bridge over the lagoon leads to the home’s entrance. The outdoor kitchen is open to a covered patio and sunken living room. There is dock space to accommodate a 90-foot-long yacht. 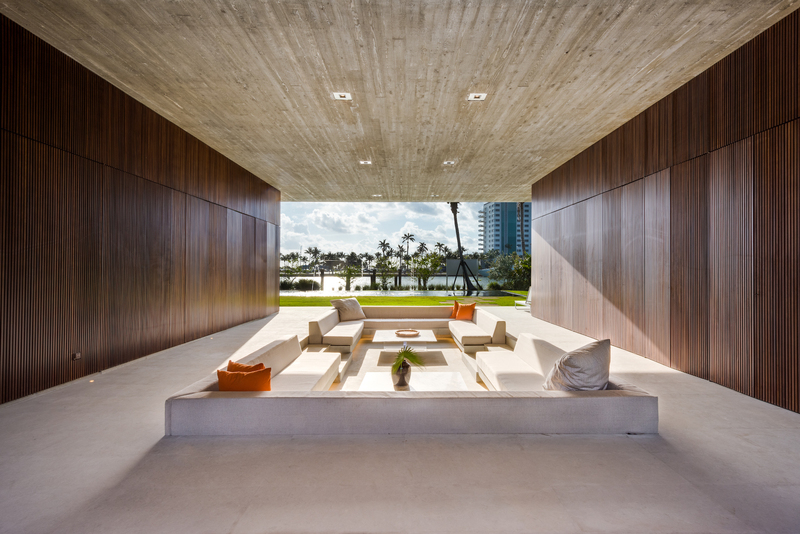 The indoor-outdoor living areas have vast sliding glass doors. 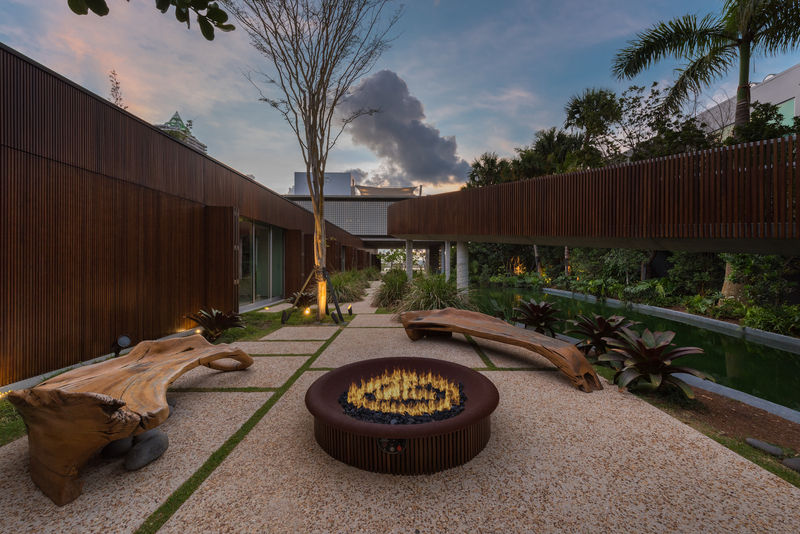 A fire pit and seating area near the lagoon have large teak wood seating. A rooftop above the bedroom wing is topped with grass and lush landscape. 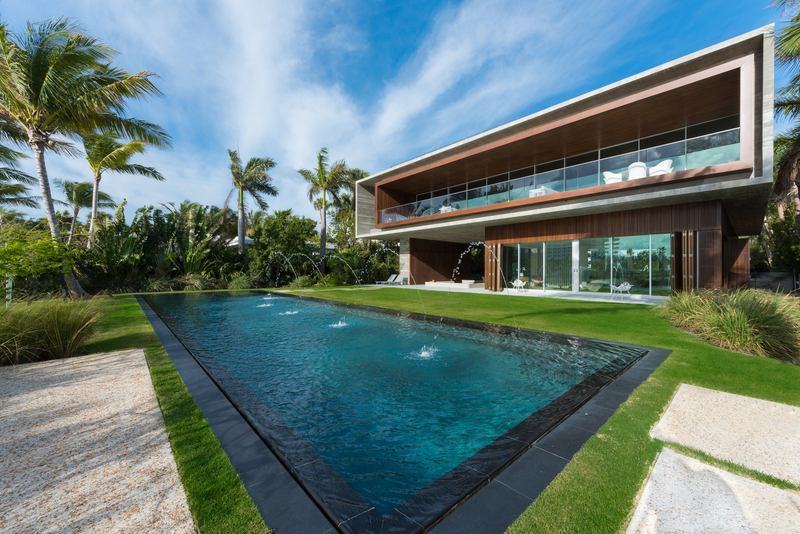 This home is listed for $25.75 million with The Jills of Coldwell Banker.